One of the features Apple introduced with the iPhone XS is the ability to adjust depth-of-field while editing photos users have already taken. But Macerkopf reports that owners of the new smartphone and the larger iPhone XS Max will also be able to change picture depth while they’re snapping photos as part of the iOS 12.1 update. Anyone who downloaded the public beta for iOS 12.1 toward the end of last week should have this capability. It’s likely to be included in the final version of the software update, which is expected to be publicly released in late October, maybe around the time the iPhone XR launches on October 26. Currently, iPhone XS and XS Max owners can adjust depth-of-field of images they’ve taken in Portrait Mode via an aperture slider on the editing screen. After the update, users will presumably only be able to do the same while they’re taking photos in Portrait Mode. This is the first time Apple’s smartphones have gotten the capability to blur photo backgrounds, but they’re a year behind Samsung. 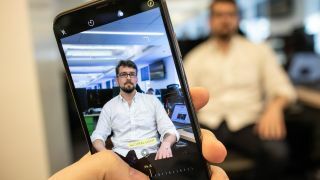 Starting with last year’s Note 8, Samsung’s Android-powered flagship phones have sported the Live Focus mode among its many features to let users fiddle with depth-of-field. The Samsung Galaxy S9, S9 Plus and Note 9 can all use Live Focus.